One way of ensuring peoples freedom is through education. The Grub Club fund is a not-for-profit organisation originally set up to assist Afghani children from the Uruzgan Province obtain an education through the supply of resources such as books, paper, pens and pencils. Uruzgan Province is one of thirty four provinces in Afghanistan. Its capital is Tarin Kowt. Due to ongoing insurgency problems little aid gets through. Australia provides a Reconstruction Task Force (RTF) which works on reconstruction and community based projects. At present we have susupended our operations in Afghanistan as we have little control over projects. We have consequently refocused our efforts on Timor Leste. On the 25th October, 2007, Sgt. 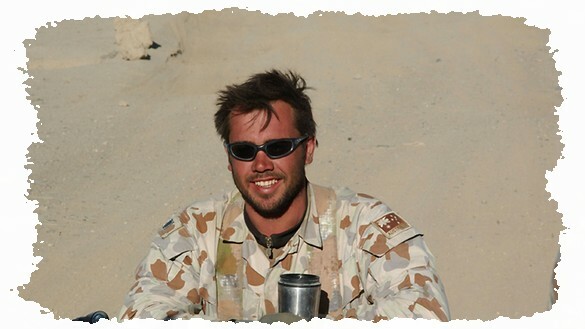 Matthew Locke was shot and killed while on duty in the Uruzgan Province. He was serving with the SASR of the Australian forces as part of the security section of the reconstruction task force. The loss of Matt has touched us all in a profound way. Matt was fiercely Australian, believing that we were lucky to live in this country but also believed that other people deserved the same freedoms that we have. Matt also spent time in Timor Leste as it transitioned from Indonesian rule to independence and conveyed to us the very real need for schools and education in this fledgling nation. The Grub Club is endeavouring to raise enough money to help with the eduation of children in Timor Leste. In Bellingen, Matthew’s nickname was Grub, so we have likewise called this fund ‘The Grub Club.’ Join the Grub Club and help Afghani and East Timorese children enjoy the same freedoms as we do by raising awareness of the plight of children in these two new nations and sharing the very real benefits we have with others. I would like to live in a world where all peoples live in peace and security and where poverty does not dictate their lives. When we educate children, we educate the world, a fitting legacy for my brother Matthew. We believe that education is the key to the success of our world’s future. An old Chinese proverb says “Give a man a fish and you feed him for a day, teach him how to fish and feed him for a lifetime.” We believe that education is the fishing rod and through this means children will be part of the future solution for current world crisis. The greater the number of children educated and the higher the level of education, the better the ability of a country to pull themselves out of poverty, making better choices for their own and the future of others. Article 26 of the Universal Declaration of Human Rights (1948) states that every child has the right to an education; we value and advocate the right of a child to an education. Our mission is to enhance the opportunities that enable a child to get an education. We would like to live in a world where all peoples live in peace and security and where poverty does not dictate their lives. When we educate children, we educate the world.